The Rumwood Nurseries Plant Centre Cash & Carry division is specifically designed to supply trade customers, such as landscape contractors, landscape gardeners, garden designers, local authorities and developers, with good quality products at competitive prices. Our comprehensive range of stock allows our Cash & Carry customers to select high quality nursery and garden centre type products, whilst also providing the inspiration and convenience required to satisfy the most demanding of planting projects. If something you need is not a stock item, we will do our utmost to source the plants from our network of suppliers. You will have horticulturally trained staff on site to help answer your questions, or please feel free to send an email with any queries or requirements - enquiries@rumwoodnurseries.co.uk. If you are looking for that instant effect, we have plants and trees available that are up to 10 metres in height. We also have access to a wide range of European and UK mature stock. As well as the extensive range of trees, shrubs and plants that we have, or can source, we also have a range of horticultural sundries in stock including composts, stakes, fertilizers, and pots, to name a few. The Cash & Carry operates on a strictly wholesale basis. 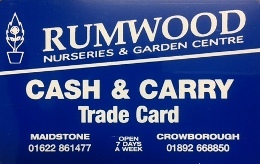 New customers will have to apply for a Rumwood Nurseries Cash & Carry Trade Card, or bring with them some proof of their trading status before buying plants. Please contact us for details on how to apply for a Trade Card: +44 (0)1622 861477 or enquiries@rumwoodnurseries.co.uk.